The standard mowing bucket (semi-gear type) is the optimal mowing machine for mounting on midi excavators. 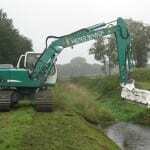 Designed especially for maintenance of watercourses, the SG carries out its work very effectively with the aid of the tried and tested MICHAELIS-cutting system, which is integrated in this model. As there is only minimal effort for installation and assembly required, the mowing bucket can be put into operation quickly, easily and conveniently. In-house development enforces a practically orientated design with compact style and powerful drive. 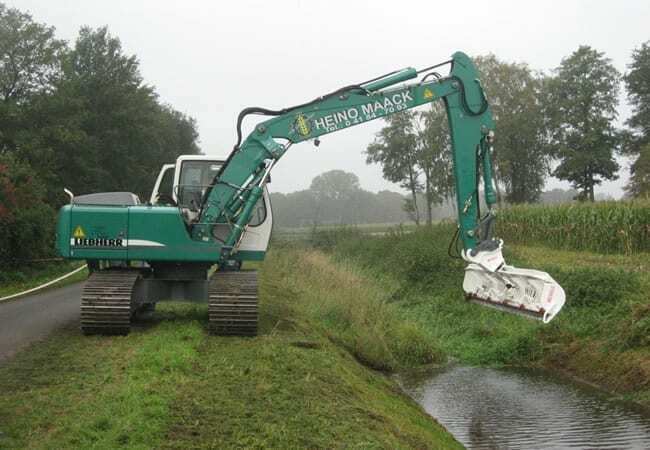 Individual adaptors for respective excavators or quick-couplers are available and suit most makes/models of equipment. Initial operation with a field test is a matter of course for Michaelis.